Between the 12th of February and the 1st of March 2018, I completed a short course ‘General Employability Skills Training Block 2’ provided by the IKON Institute of Australia. The training took place at Job Prospects on Paisley St in Footscray, and attendance was a mandatory requirement in order for me to remain a recipient of the Newstart allowance. At the start of the program, there were approximately fifteen Newstart recipients enrolled. By the end of the three weeks, only one other person and myself had completed the course. The remaining thirteen people had their payments cut. Rather than simply receiving a payment from Centrelink, Newstart recipients are expected to fulfil ‘mutual obligation requirements’, which are managed by an external organisation, called a Job Service Provider. After choosing a provider, recipients are assigned to a consultant, who is the main person you interact with. My consultant’s name is Joe. Your consultant is then required to sign you up to a government program called ‘jobactive’, which is “the Australian Government’s way to get more Australians into work”. In the language of jobactive, I am the ‘jobseeker’. As of April 2017, jobseekers between 15 and 24 years of age who have been signed up to jobactive for more than 5 months were required to enrol in an Employability Skills Training course. This was announced with the 2016-2017 Federal Budget, and is part of the same program (Youth Jobs PaTH) that introduced the infamous ‘$6-per-hour subsidised internships’. At the time I commenced the course, I had been lucky to receive free access to a studio where I had begun to work as an artist. This is time I was spending applying for jobs, grants, residencies, etc. as well as completing research towards artistic projects. I had to put this work on hold to complete the course. The AUWU submission also notes that given Training Providers are to be paid “between $403.70 and $504.35 for each participant for each completed block of training” (p3) there are in fact incentives for Job Service Providers to ignore legitimate extenuating circumstances, due to a partnership with the Training Provider. For me, this resulted in being forced to participate in a functionally useless training course, but for others it could mean having vital payments cut due to absence related to sickness, or a family crisis. It would be at the discretion of a for-profit company to determine whether these qualify as a ‘reasonable excuse’. My facilitator’s name was Karen. She is employed as a contractor by a training agency which provides facilitators to the IKON Institute. She was in my view a really genuine, honest and compassionate woman, and she was very open about the issues she had working for this agency. One issue was that as a contractor, she was only paid per completion, and this led to rising anxiety for her as she slowly realised that almost the entirety of the Footscray cohort would not attend enough to complete the course. She said that without a minimum amount of completions, there was a risk that she would not be paid at all. Karen lives near Warragul, Victoria. The daily trip to Footscray on the V/Line for her was 2.5 hours each way. The course ran from Monday to Thursday each week, 9:30am to 3pm (with one and a half hours total break time). For some of these days, there was only one attendee. The course was structured around completing a workbook of around a hundred pages, with certain activities, tasks and questions related to a different general theme for each day. At the end of each day we completed a ‘Reflective Journal’, which asked us what questions we had had answered that day, and what we were grateful for. At one point the workbook asked us to watch a clip from The Big Bang Theory and write down which character we most identified with and why. In another question, we were presented with a series of portraits of a man making different facial expressions, and asked to write down which emotion we thought the man was portraying. On top of this, Karen was able to freestyle a bit, because the coursework alone was nowhere near enough to take up the total 48 hours. Often this meant having long discussions around anything from workplace culture and emotional intelligence to economics, politics and activism. Karen liked the opportunity to learn about our experiences. Another thing we often did was watch inspirational videos. One video was a compilation of quotes from Will Smith interviews. Another clip was from a National Geographic show Going Ape, an episode called ‘The Alpha Male’. In the TV show, different people were invited to be part of social experiments where they learned how to embody the dominant, assertive characteristics of Alpha Males. Karen said that anyone, boys or girls, could be an Alpha Male, and this was something we should aspire to if we want to make it in the modern workforce. On one day, me and Karen just watched the movie The Pursuit of Happyness. I cried at one point but also thought it was neoliberal capitalist propaganda that retrospectively justifies Reaganite austerity through a patriotic invidualist transformation myth and bizarrely (pre-GFC) portrays the wealth of stockbrokers as an unironic vision of an ideal American life. Karen also cried, despite having seen the film dozens of times; she is a fan of Will Smith and thinks the film is beautiful and inspiring. Maybe in a way it helped make sense of the bizarre life circumstances she had been though to end up here, a grandmother, being underpaid for what even she described as essentially punitive work at a Footscray job agency, she and her insurance claims husband working to pay off a home loan near Warragul, having fought sexism when she was a Metro train driver and having not gone to uni because her mother told her she was dumb. I decided not to whip out the Screen and Cultural Studies degree. 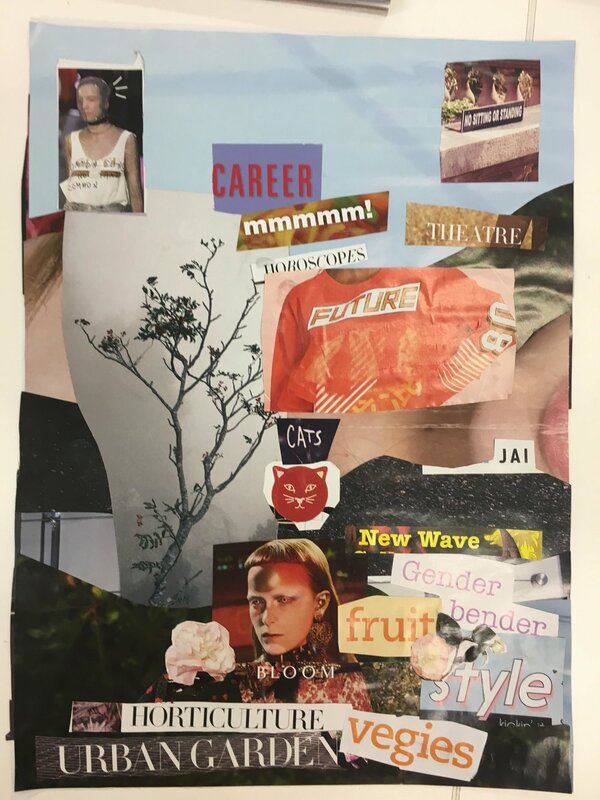 Provided in this zine is my finished vision board, and as my most outstanding outcome from the entire course, I invite arts industry professionals to take it as proof of my employability. Please contact me about arranging a $6-per-hour internship.